A Thai Menu With A Twist! The Green Mango has had a face lift… and a name change. 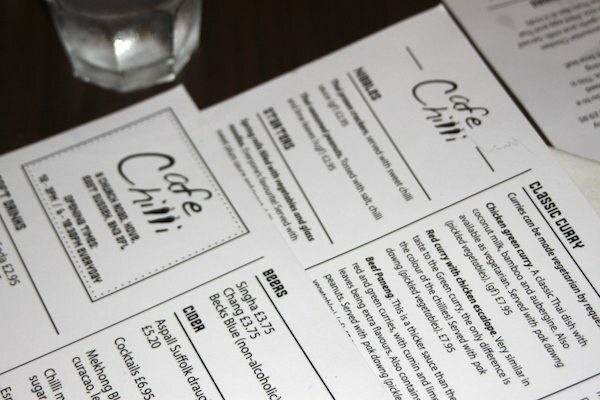 Rebranded and redesigned, Cafe Chilli promises something a little different. Deciding to make some drastic changes to their menu and the decor, the folks behind The Green Mango decided to go the whole hog and came up with Café Chilli. This Thai restaurant with a twist is the result of five years of experience running the Green Mango and a Thai chef with over twenty years’ experience cooking Thai food with traditional Thai ingredients. The twist? They say they ‘want to swerve away from the generic Thai menu seen in most Thai restaurants and incorporate some fusion dishes’. This is a concept that interests me, so I thought I’d pop along and see what dishes might tickle my taste buds. Ideally located on Church Road, amongst a good spattering of other great Hove restaurants, Café Chilli is not short of competition. 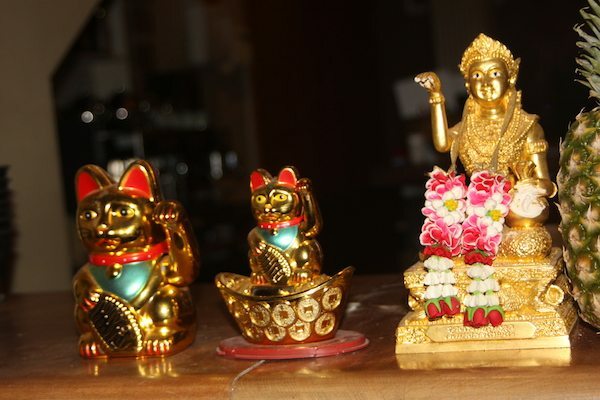 The décor is clean and modern, but nods to its Asian roots, by way of few ornaments placed at the bar – including the mandatory waving cat and Golden Buddha. We are seated underneath the specials boards opposite the bar by our cheery waiter. I take a moment to take the place in, whilst perusing the drinks menu. 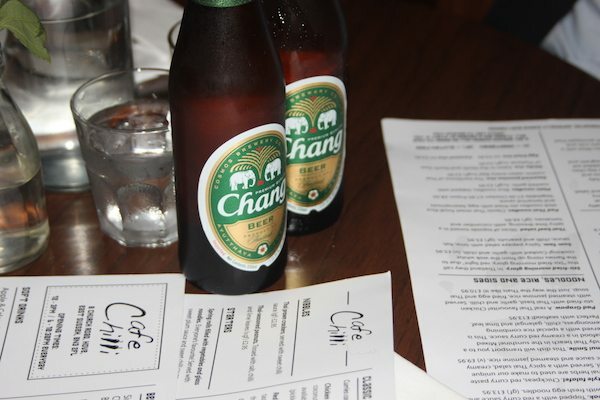 We order two Chang beer and glance upwards, towards the specials. Having had a look at the menu before heading to Café Chilli tonight, I know what I am having before I step foot inside. Eager to sample the more ‘fusion’ elements of the menu, I am more or less sold on the Chilli Pesto Spaghetti. Two of my favourite cuisines, rolled into one tasty offering. Classic pesto with added red chilli and Thai basil, mixed with spaghetti and seafood; this sounds perfect for me. My partner sips his Chang and contemplates dishes such as: Red Curry with Chicken Escalope, Beef Paneng, Pad Grapow (Chicken stir-fried with Thai basil, garlic and chilli, served with steamed jasmine rice, fried egg and Thai soup), Steak Jim Jeao (sirloin steak with salad and sticky rice with a spicy chilli dip from the North-East of Thailand, served with fresh egg noodles) and a Japanese offering – Miso Glazed Grilled Aubergines. It is fair to say that some of the main courses on the menu deviate away from the more traditional Thai cuisine you might expect, adding a sense of intrigue. However, this is clearly a Thai menu. You won’t be disappointed if you are after the classics. Pad Thai Noodles and Chicken Green Curry take pride of place at the top of ‘Noodles’ and ‘Classic Curries’ sections. In the end it is the more traditional sounding dishes that win my partner over. To start he opts for the Thai Sausage. 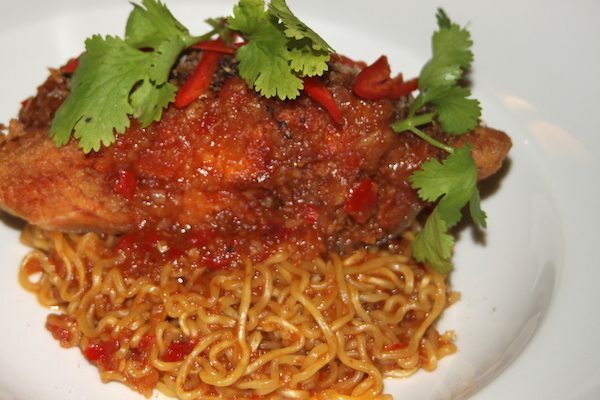 Originating from Northern Thailand, Chilli Café say this is a dish not to miss. 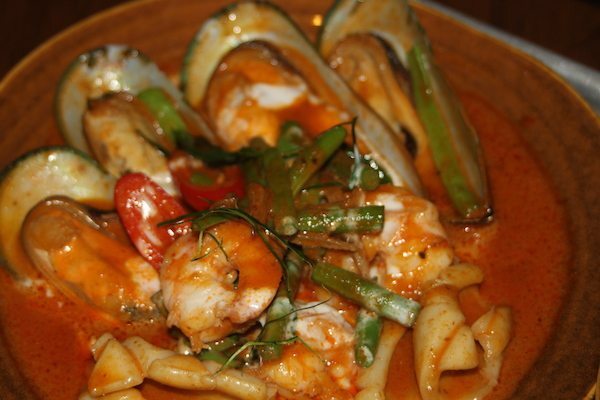 For his main he chooses Samui Smile (mixed seafood in a creamy red curry sauce). I am being very indecisive, but finally pick from the specials board Salmon stuffed with Crab Meat (served with noodles). 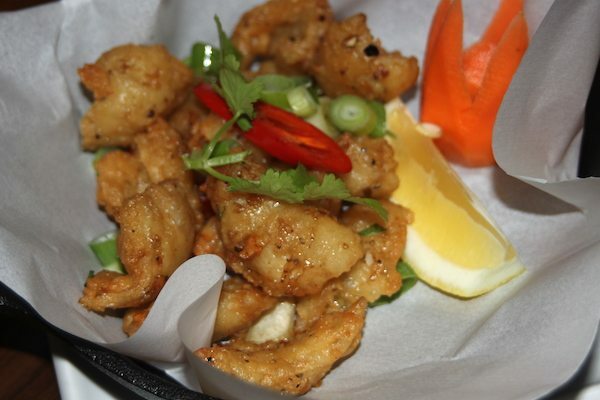 To precede this, a classic and favourite of both of ours, Crispy Chilli Squid. Oh and some Morning Glory for good measure to accompany our mains. 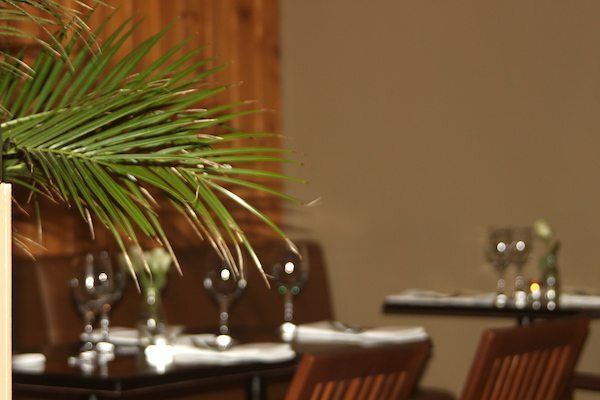 The restaurant is quiet this evening, so it’s not long before the starters arrive. The squid, which is coated in a batter with salt, pepper and chilli, is fried perfectly in a delicious, inexplicably crispy batter. We both agree with the sentiment on the menu: ‘try it, love it!’ This has to be some of the most enjoyable crispy squid we have had in a long time. It comes without a dipping sauce, but honestly, the dish doesn’t need it. 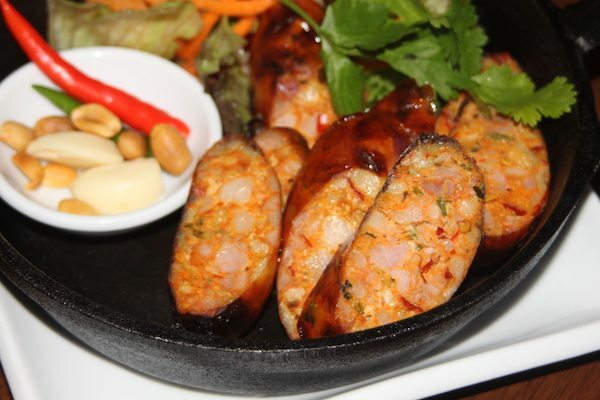 We have no complaints with the Thai Sausage either. Full of flavour and packed with authentic tasty herbs and spices. We are a little confused by the cloves of raw garlic it is served with, but trust that this must be the traditional way. We are off to a great start. We guzzle both dishes down in no time at all! Mains follow promptly. My partner’s dish is quite lovely to look at and glistens in a vivid red sauce. The big mussels – still in their shells – creep up from his plate, asking to be devoured. All served alongside a bowl ‘special’ rice with lemongrass, chilli, galangal and lime leaf and some small cubes of pickle vegetables. The flavours are good in this dish. 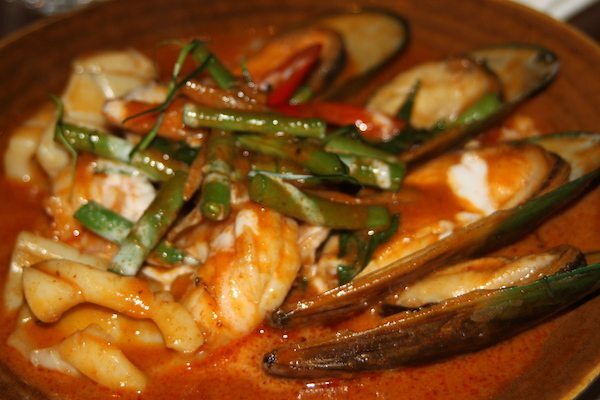 The sauce has hints of authentic ingredients such as Thai basil and in the rice, the lemongrass really shines through. The seafood is cooked well and there is enough of it. The green beans scattered over the top, add some crunch and colour. My dish comes with a crumb coating on it. I consider this must be the cumin, coconut and black pepper topping described on the menu, although I do find it a little hard to distinguish these flavours in the dish. 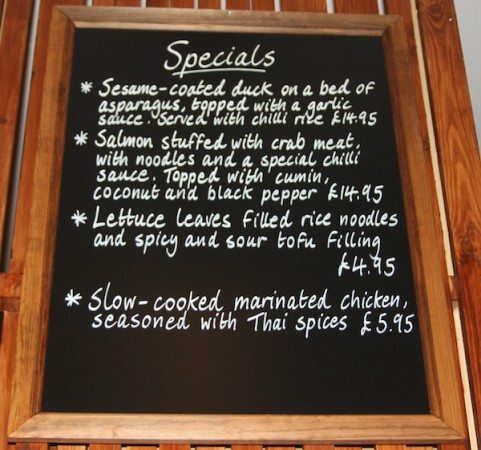 The special chilli sauce is very similar to a sweet chilli sauce and coats the salmon and the noodles. The salmon serving is generous – with a fair amount of crab filling. This is presented on a pile of egg noodles – also a generous serving. The sauce is very sweet and I am grateful for the Moring Glory greens to offset some of the sweetness. I have to say this dish was not exactly what I was expecting, but the salmon was tasty, even if it was a little overwhelmed by the sauce. I am very full after my main – it proved rather formidable. My partner as always is eager to sink his teeth into something sweet. 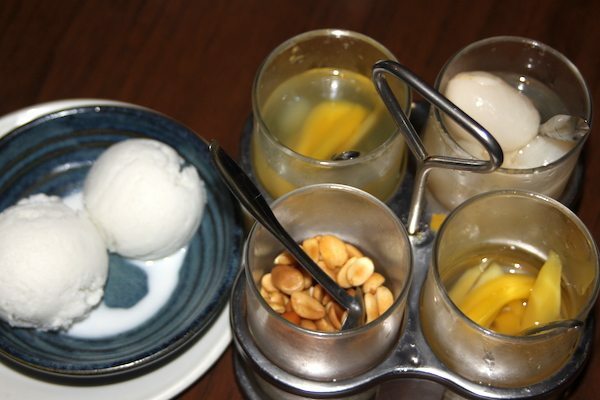 We always go for banana fritters, but tonight the coconut ice-cream seems more manageable. 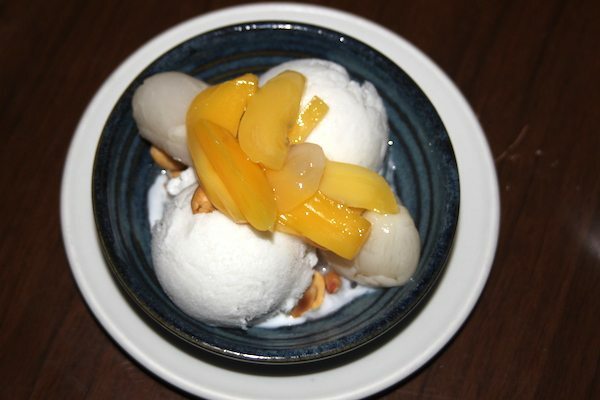 Served alongside peanuts, lychees and mango in syrup sauces, this seemingly simple dessert is a delight. Perfect to cleanse the palate and perfect for sharing. I also enjoy the way the ‘extras’ are served to us in little jars, so we get to build our own dessert. These savoury, creamy and sweet flavours all come together in perfect harmony. All in all we have enjoyed our meal at Café Chilli. The starters in particular have impressed. We leave with full bellies, have received service with a smile all evening and I would certainly consider a return trip to try out that Chilli Pesto Spaghetti!